Samsung Digimax V600 introduction : Samsung Camera is proud to introduce the 6 Megapixel V600 at this year's PMA. Following the Samsung Digimax V50, introduced at PMA 2004, the Samsung V600 is among the latest addition to Samsung's highly successful V-Series line of high end digital cameras. 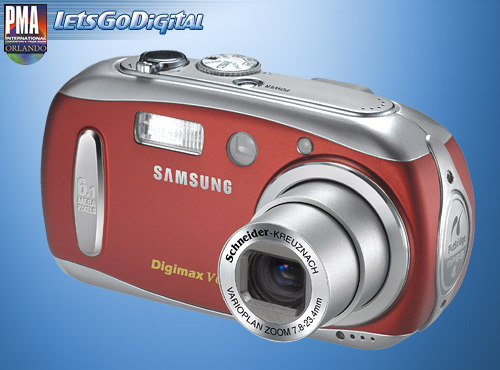 Competitively priced at $359.99, the Samsung Digimax V600 is sure to turn heads with its unparalleled style, availability in 3 colors (noble wine, indigo blue or milk silver), and host of features, making it one of the most affordable, advanced point-and-shoot digital still camera on the market today. "We are very excited about the launch of the Samsung Digimax V600, as the camera represents the third generation of our V-Series line," said Ken Gerb, Senior Vice President, Sales for Samsung Camera. "The camera is both compact and fun; however, at the same time the Samsung V600 is underscored by a professional stature that builds upon the their versatility and ability to perform." With features like an Auto 4cm super macro mode, huge 2-inch color LCD display and powerful manual controls, the Samsung V600 is ideal for virtually every application. Following in the footsteps of the popular Samsung Digimax V50, the cameras combine quality construction and style, world-class Schneider optics, a plethora of customization modes and other features, creating two of the foremost digital cameras in their respective classes. 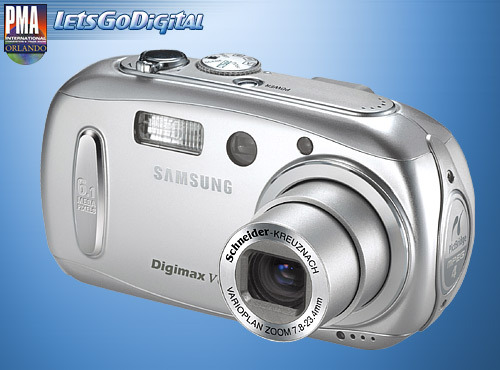 The Samsung Digimax V600 packs a 1/1.8" CCD sensor in a stylish aluminum enclosure that's easy to use and to hold. With high-quality f/2.8 ~ 5.1 Schneider 7.8mm - 23.4mm lenses (equivalent to a 38 - 114mm lens in 35mm format) the camera provides an enormous array of features in one sleek package. The Auto macro mode captures images as close as 4cm, while the 10x digital zoom extends the range of the Schneider lens into the super-telephoto range. With auto macro functions, the Samsung V600 automatically adjust shooting distance and focus. Shooters can press the macro button in Auto mode to set the camera to adjust distance and focus automatically from 4cm to infinity, providing crystal clear images regardless of the shooting range. A 2-inch TFT LCD screen provide large focusing areas and is also home to the cameras' wider range of creative controls. Intuitive graphical user interfaces (GUI) allow users to easily navigate the cameras' menu of features and capabilities. Photographers have a full range of custom choices including a variety of exposure modes, five ISO settings, five flash settings and more. The Samsung Digimax V600 utilizes a combination mechanical and electronic shutter to capture images at up to 1/2,000 of a second. The camera can capture still images in single, continuous, AWB, AEB or AFB modes, at sizes up to 5MB and store them as TIFF, JPEG (DCF), EXIF 2.2 or DPOF format. AEB shooting provides a choice of presets custom designed for some typical, and also some difficult to master, shooting environments. The Samsung Digimax V600 includes pre-programmed settings in an Auto mode, Program mode, A, S, M mode and Scene modes including: Night, Portrait, Children, Landscape, Close-up, Sunset, Dawn, Backlight, Fireworks, Beach & Snow and Text. When set in Text mode, users can shoot documents such as books, papers, magazines or business cards while the camera automatically compensates for image distortion that typically occurs when photos of flat objects are taken. With the bundled, text recognition software (Digimax Reader), users can extract the text from images taken in Text mode and save them as editable documents. For even more exposure control, the Samsung V600 provide a live, real-time histogram that displays a variety of shooting information, including brightness and contrast, to help adjust exposure seamlessly. When in use, the histogram will vastly increase the number of great pictures taken through more accurate exposure adjustments. For enhanced movie-shooting, the Samsung Digimax V600 supports MPEG-4 video compression, providing recording times which are 3 to 4 times longer than conventional digital cameras. 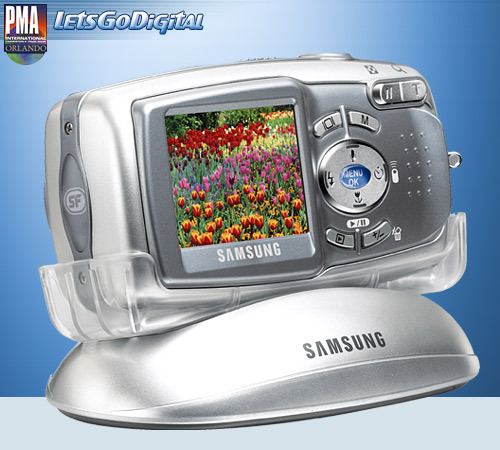 The Samsung Digimax V600 has the ability to capture movie clips in VGA (640 x 480) at 30fps, and also boasts a movie clip stabilizer for video recording. Through automatic detection and correction of lateral and vertical camera movement caused by the shooter’s unsteady hand, the recording of the subject itself is kept steady. The camera also features movie clip editing functions, which were previously only possible with the use of a PC. Users can now make better videos with options such as the ability to select a part of a movie clip for saving during playback as well as the ability to select part of a movie clip to be saved as a still image, all performed right from the camera. The enhanced movie mode options don't stop there as the Samsung V600 features successive video recording based on unique Samsung technology. With successive recording, shooters can pause and resume video recording at any time and merge multiple video files into one single file. The Samsung Digimax V600 also takes advantage of the small form-factor of SD/MMC storage cards with guaranteed storage of up to 1GB. SD is quickly becoming the preferred storage media for compact digital cameras thanks to the formats ability to pack a large amount of data into a small space. With thin dimensions, the Samsung Digimax V600 is designed to support the 3V Duracell CP1 high-power lithium battery, an optional rechargeable 3V Li-ion (SLB-1137) from Samsung or an AC adapter. The camera transfers images via built-in USB 2.0 connection and comes with software for both the Windows and the Macintosh platforms including Digimax Viewer, ArcSoft PhotoImpression and Digimax Reader. The Samsung V600 can also be connected to NTSC or PAL external monitors for image and movie playback via the included connectors. The Samsung Digimax V600 also offers PictBridge technology, allowing users to connect the camera directly to a printer via USB cable and output images right from the cameras' internal memory or SD card. A related feature that comes in handy is the ability to edit, crop and resize images right on the camera before sending them to a computer or printer for distribution or output. The camera also features 3 special effect modes; Highlight, Composite and Photo Frames. Highlight enables shooters to emphasize a subject by putting its surroundings into soft focus. This is made possible using digital processing within the camera. With Composite, users have the ability to divide a shooting scene into 2-4 segments and save it as a single file, while Photo Frame allows users to add a frame to an existing image.